Now in its seventh year, Passion4Hospitality 2017, which took place on Monday 13 March at Novotel London West, provided networking and advice for hospitality management students at the start of their careers. arena4finance was delighted to take part to sponsor the HOTS Business Game. The all-day programme included inspirational stories from hospitality leaders, speed networking and one-to-one careers advice, the student debating competition and the HOTS Business Game to successfully operate a virtual resort hotel. The subject of the debate was “Hospitality is about creating experiences, not processes and procedures.” Six universities put forward teams: University of Surrey, Plymouth University, Hong Kong Polytechnic University, Glion Institute of Higher Education, University of Derby and University of Brighton. The finalists from Plymouth University (Lilla Ferencz and James Cusselle pictured) and the University of Derby (Anna Derby, Marulis Elena-Cristiana and Ieuaf Griffiths) went head-to-head in front of the live audience. An audience vote declared the Plymouth University team winners. 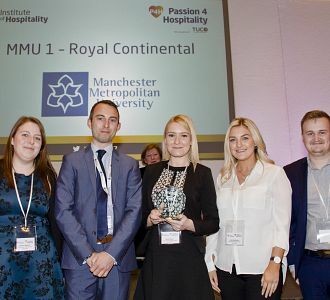 Lilla Ferencz and James Cusselle received their trophy from Michael Sloan FIH MI, general manager of the Novotel London West, the venue sponsor, and from Matthew White FIH, chair of the University Caterers Organisation (TUCO) the headline sponsor of Passion4Hospitality 2017. The HOTS Business Game consisted of a competition to successfully operate a virtual hotel, setting up rate, revenue and marketing strategies for a full year. The finalists were teams from Plymouth University, Manchester Metropolitan University and University of Surrey. Three individuals were awarded special merit for their performances during the day: Joyce Tsang, Rowan Boothroyd and Georgia Armstrong. The overall winners were Joseph Hoare, Victoria Stewart, Katie Bradshaw and Beth Ineson from Manchester Metropolitan University. In second place came another team from Manchester Metropolitan University: Alex Wood, Georgia Armstrong, Callum Nicholls and Jordan Scott. The Passion4Hospitality 2017 programme featured a keynote presentation “Who’s life is it anyway?” by Ben Bengougam FIH, Senior Vice President of HR EMEA, Hilton Worldwide. The headline sponsor of Passion4Hospitality 2017 was the University Caterers Organisation (TUCO). The other sponsors were: Glion Institute of Higher Education, Snapshot, Fresh Montgomery, Novotel London West, arena4finance, HOTS, The Savoy Educational Trust, The Council for Hospitality Management Education (CHME) and Waters Productions.